The South Valley Symphony is a non-profit, community based orchestra which brings the best in classical and popular music to residents of the South Valley. It acts as a bridge between different ages, cultures, backgrounds and experiences, and gives all the opportunity to hear and feel the excitement of music performed live by a Symphony orchestra. All Symphony members are volunteers and manage the logistics of the concert season. We keep ticket prices low to encourage people from all walks of life to attend, and children and college students are free. Expenses associated with production and promotion of concerts increase annually thus we ask for additional help in the form of corporate and private contributions. South Valley Symphony is a 501 (c)(3) organization and all contributions including cash donations, sponsorships, and in-kind gifts are tax deductible. HERE ARE WAYS YOU CAN MAKE A DIFFERENCE! A gift to the Symphony is helping your community preserve a valuable and beautiful part of community life and a legacy for your children and grandchildren. Please consider a gift of cash or “in-kind”. Your gift may be made in honor of, or in memory of, someone special. All donors are listed in each Symphony concert program unless a donor asks to remain Anonymous. In-Kind gifts are very valuable to South Valley Symphony and are also fully tax-deductible. The following needs are from our current wish list and if you feel you can donate one or more of these, please contact svsboard@southvalleysymphony.org. Many corporations give back to the community through matching donations and some corporations will actually double your donation. Contact Human Resources in your company to find out if it has a matching gifts program when you make your donation to the South Valley Symphony. 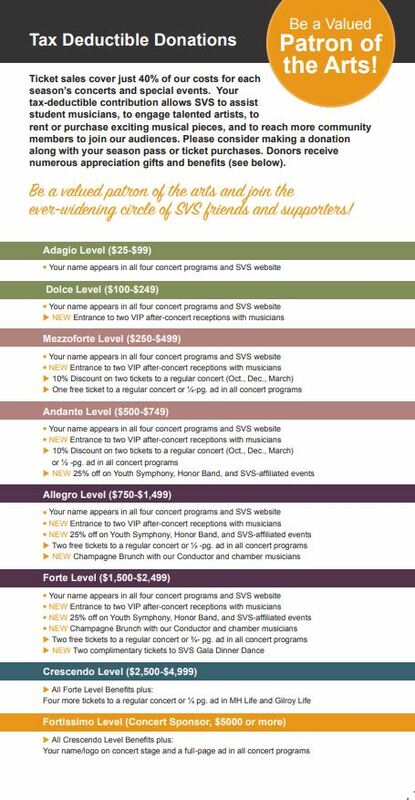 To sponsor a concert, please contact us at orchestra@southvalleysymphony.org to discuss details. Please help ensure the South Valley Symphony will thrive well into the future with a legacy gift. Legacy gifts are given by are generous individuals who have used their estate plans to add to the South Valley Symphony Endowment Funds. For many, a gift from their estate is the most meaningful gift ever. It preserves their family name as a supporter of symphonic music in our community forever. It is easy to give a Legacy gift. Simply let us know at orchestra@southvalleysymphony.org that you wish to make a Legacy gift and we will send you a form to complete. (The Symphony partners with the Gilroy Foundation and the Symphony’s Endowment Funds are managed by them).